React Native Express: Learn React Native in the Browser — Want to see how React Native ticks without any setup or devices? Learn React Native with interactive examples on this site. The Most Common XSS Vulnerability in React Apps — Em explains how if you’ve copied the renderFullPage function from the Redux documentation, you’re vulnerable to a cross-site scripting attack. 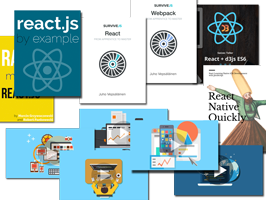 React Indie Bundle: Improve your React, help opensource — Everything you need to become a better React engineer. 6 books for over 900 pages, over 72 hours of video courses, and some goodies. $1000 worth of React resources for $450 or less. Build your own bundle and get just what you need. React's New Core Algorithm, React Fiber — A straightforward description of Fiber, an ongoing reimplementation of React’s core algorithm. This is now increasingly relevant as Fiber is (very) gradually entering production. A Practical Guide to Redux — A hands on guide for setting up Redux in a React project. The post includes a repo and demo app to help you get up and running with Redux as painlessly as possible. Getting Started with React Native and Flow — Adding static typing to your React Native application. Why Redux Needs Reducers to Be 'Pure Functions' — You may have heard that Redux depends on “pure functions” from functional programming. Well, what exactly does that mean? 3 of The Most Common Errors in React — Covering “Uncaught (in promise) TypeError”, “Objects are not valid as a React child” and a React.createElement error. Advanced Data Tables in React — A look at some data table libraries in React, how they compare to each other, and suggestions as to which one you should choose depending on your context. How to Build a Realtime Activity Feed with React and Pusher — Build a simple Node.js REST API with Express and Mongoose to work with generic measurements (such as temperatures).